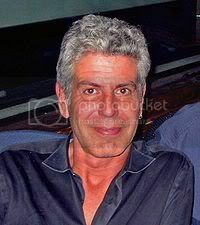 My favorite bad boy chef and author, Anthony Bourdain, rolled up his right sleeve to show off his tattoo — not of a beating cobra heart or other adventure from his Travel Channel show "No Reservations. It comes from a book, Sarah Bakewell's "How to Live: A Life of Montaigne in One Question and Twenty Attempts at an Answer," which describes a coin Montaigne had struck. Bourdain explains that the coin, and the tattoo, bear the 16th century essayist's "personal motto, basically, 'I suspend judgment' in ancient Greek." This month, Ecco, part of HarperCollins, announced that it will create an imprint for Bourdain, putting out four to six books a year that he brings to the publisher.